Meringue cookies never disappoint. These sweet, light-as-air Peppermint Meringue Cookies will add the perfect pop of pretty to your holiday cookie tray. 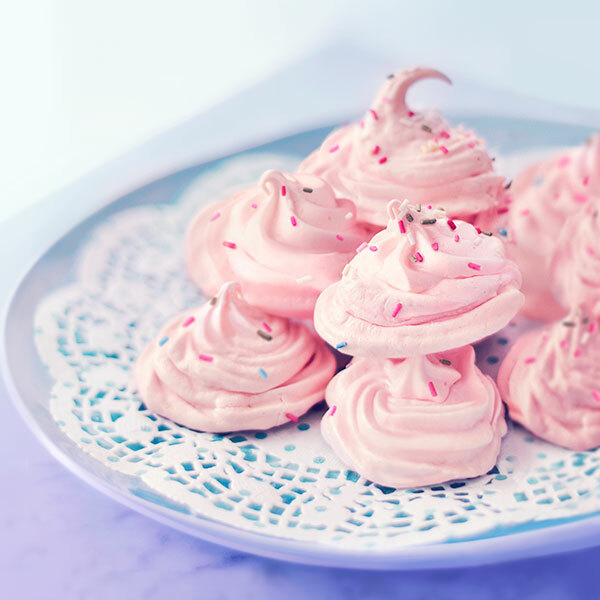 The pink tint in our Peppermint Meringue Cookie recipe makes them seem even more dainty. Your guests will find these minty swirls refreshingly satisfying. Take bowl from saucepan and beat mixture with an electric mixer fitted with the whisk attachment, starting on low speed. Gradually increase speed to high while beating until stiff, glossy peaks form—about 5 to 7 minutes. Add peppermint extract and food coloring, and then mix until combined. Transfer mixture to a pastry bag fitted with a star-shaped pastry tip. Pipe small circles 2 inches apart on a parchment-covered baking sheet. Place in oven and bake with oven door open for 30 minutes. Turn oven off and leave in oven for another 30 minutes, still keeping the oven door open. Remove cookies from oven. Add sprinkles to each cookie and allow to cool completely before storing or serving.